I’m a side sleeper. Which means every morning I wake up, the first thing I see is our dresser. The cheap, boring, thrift store dresser. After waking up to this bland sight for wayyyy too many mornings in a row, I decided to DIY that garbage. Now, it’s bedroom stunna that has my style written all over it. Pinterest, as usual, was my inspiration. I saw the pin below and loved the simplicity and geometric lines. I decided to leave the outside of my dresser unpainted to frame the chevron strip because, you know, personalization and all. To paint the drawers, I measured and sketched on my chevron stripe, taped the plastic drop cloth over the parts I didn’t want painted and followed the instructions (I actually do that sometime) on the spray paint can. And it worked like a charm! After the paint job was done, I moved on to the final touches. Drawer pulls are the necklaces of dressers. They’re a super affordable way to dress up any furniture. I’ve seen people use spoons, toy animals, twigs, spray-painted rocks and leather straps. I’m apparently less creative than these people because I just bought a couple dollars of gold circle pulls. The point is: you don’t have to spend a lot for a big impact. Okay, okay, here’s the part you probably scrolled to look at first and then went back to actually read this post. The before and after photos! For all you uuber perfectionists out there, yes I know the lines don’t match up perfectly. Did I forget to compensate for the gaps between the drawers when spray painting? Did I intentionally mismatch the lines a bit to add some personality? You’ll never know. Let’s focus on the wall art for a hot second. Pinerest was my muse on this, too. I took Google map screenshots of all the places Brian and I have traveled together, color corrected them to my own liking and mod podged those beauties to hard poster boards that I cut into hexagon shapes. I love that I get to see a little passport of our travels every day. So there you have it! 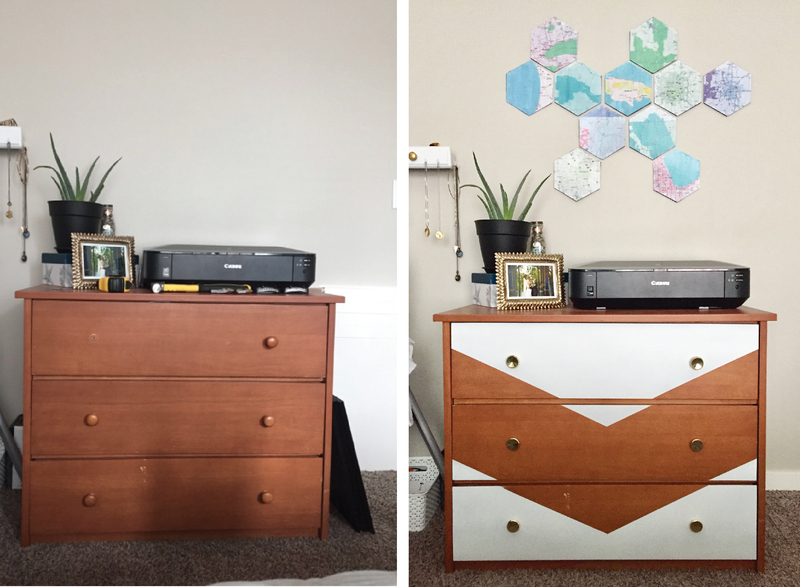 A dresser facelift on a plebeian’s budget! Have you done any cool DIYs lately? I’d love to hear about them. Let me know in the comments!